Explanation: Why are these people shooting a powerful laser into the center of our Galaxy? Fortunately, this is not meant to be the first step in a Galactic war. Rather, astronomers at the Very Large Telescope (VLT) site in Chile are trying to measure the distortions of Earth's ever changing atmosphere. Constant imaging of high-altitude atoms excited by the laser -- which appear like an artificial star -- allow astronomers to instantly measure atmospheric blurring. This information is fed back to a VLT telescope mirror which is then slightly deformed to minimize this blurring. In this case, a VLT was observing our Galaxy's center, and so Earth's atmospheric blurring in that direction was needed. As for inter-galaxy warfare, when viewed from our Galaxy's center, no casualties are expected. In fact, the light from this powerful laser would combine with light from our Sun to together appear only as bright as a faint and distant star. Glad they cleared THAT up! We have enough troubles already! All that won't be necessary when they finally launch the James Webb Space Telescope. By the way when will they launch it? They have been talking about it replacing the ailing Hubble for the past 15 years. I have even a magazine that says it was scheduled to launch in the year 2018. It is now 2019. Going to be awhile yet! Laser beams are invisible unless reflected off smoke dust fog or some other particulates. The light shining on the dome doors is obviously faked. I don't doubt the visibility of the 589nm beam is more pronounced in the image, but it's certainly not fake. In fact, I'd expect the scattered light from the laser beam itself and that onto the dome opening to be visible by eye in the dark of night. Note that the Milky Way and stars are seen better in the image that with the unaided eye. The image shows stars fainter than mag 8. The image is showing the laser beam brighter that it would appear to the unaided eye. First, in "pure" air without aerosols, Rayleigh scattering will make the beam visible. Under a Class 100 HEPA filter, I've seen a green laser beam glow beautifully uniform without bright flashes from particulates. If you're in an unfiltered environment, there'll be varying degrees of particulates and moisture, and there'll be more scattering as you said. The VLT is in such an unfiltered environment. Second, since these LGS lasers have a Gaussian (continuous) intensity distribution, scattering within the optical tube assembly will occur at some level from one or multiple mirrors. I suspect that what we see is primary or secondary scattering at the exit aperture of that launch tube. You see, I've spent my career working with and building lasers of all colors and powers. <<Astronomers back on Earth periodically fire lasers at these suitcase-size banks of reflectors to determine where the Moon is in its orbit and, specifically, precisely how far it is from Earth. Initially, the laser ranging was good to an accuracy of about 15 cm, 100 times better than any previous method. But in recent years the accuracy has gotten down to nearly 1 mm, thanks to an effort led by Thomas Murphy (University of California, San Diego) using the 3.5-m reflector at Apache Point Observatory in New Mexico. (Amusingly, Murphy has named the effort the "Apache Point Observatory Lunar Laser-ranging Operation," or APOLLO.) Moreover, thanks to Lunar Reconnaisance Orbiter's images of the long-lost Lunokhod 1 rover (spotted by Russian scientists, by the way), the count of available reflector sites on the Moon now stands at five. Some years ago, Murphy and his colleagues noticed that the laser pulses were coming back to Earth weaker than expected. "Each shot sends about 1017 [100 quadrillion] photons toward the Moon, and in good conditions we detect about one return photon per shot," the team noted in an article published in Icarus. That's only about a tenth of what should be coming back, leading to suspicion that a microscopic veneer of lunar dust has coated (or abraded) about half the area of the exposed optical surfaces. But something else is causing weak returns, and the dropoff gets particularly bad (by another factor of 10) around full Moon. In Icarus, Murphy and his team surmised that the problem is due to distortions in the optics due to heat from the Sun. The Apollo program's prisms are recessed into shallow cylinders, so sunlight illuminates them fully only at high noon — that is, around the time of full Moon. The thermal effect is much worse for the Lunokhod arrays — they can't be used at all during the lunar day. One way to confirm this hypothesis would be to monitor the reflectors' performance during a total lunar eclipse. The rapid plunge into shadow, Murphy reasoned, should allow the optics to cool and relax. Some earlier observations during eclipses already hinted that solar heating was indeed the culprit, but Apache Point was clouded out during lunar eclipses in 2007 and 2008. Last edited by neufer on Mon Jan 07, 2019 2:39 pm, edited 1 time in total. but you are still wrong. First there was fake news and now there's fake APODs? What would Donald Trump think? First there was fake news and now there's fake APODs? What would Donald Trump think? IMO the actual fake part of the Jan 6 APOD is the green screen display of the Milky Way. Thanks Geck. Why educate when you can cast blame? Boomer, alter-ego and Neufer got nothin' on you. The laser launch telescope is a 40 cm refractor (acting as a 20x beam expander) with a 97.7% throughput. That telescope is baffled and coated with a light absorbing material. So I'm guessing we're not seeing any scattered light from the optical train at all. Most likely, the telescope and dome structures are simply illuminated by the primary atmospheric scatter. I'm not sure if that would be visible to our eyes or not, but it's not in the least surprising it would be captured by an exposure long enough to record this much depth in the sky field. <<April 2016 saw the arrival of four new stars above the Paranal skies. 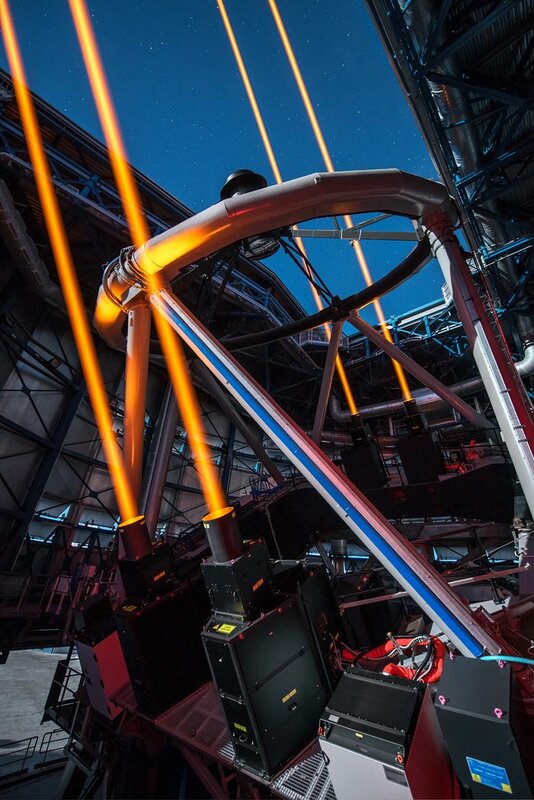 After years of development, ESO has completed the installation of the 4 Laser Guide Star Facility or 4LGSF, a new subsystem of the Adaptive Optics Facility (AOF) at the Very Large Telescope (VLT). The 4LGSF complements the Laser Guide Star Facility (LGSF). Instead of one laser, the 4LGSF sends four laser beams into the skies to produce four artificial stars by exciting sodium atoms located in the atmosphere at an altitude of 90 kilometres. Each laser delivers 22 watts of power — about 4000 times the maximum allowed for a laser pointer — in a beam with a diameter of 30 centimetres. Lasers can excite sodium atoms in the mesosphere, which is located 90–110 kilometres above the Earth’s surface. The fluorescent light that is emitted by the sodium atoms and collected by the telescope is affected by the atmosphere in the same way as the light emitted by real stars is. So, the fluorescent light from the sodium atoms can be used by the adaptive optics system to measure and compensate for the distortions introduced by the atmosphere. ESO and several European institutes and industries, including TOPTICA, Germany; TNO, the Netherlands; MPB Communications, Canada; Optec, Italy; Astrel, Italy; and Laseroptik, Germany and INAF–Osservatorio di Roma, have made significant contributions to the project. The new 4LGSF is based on several new technologies. One of these is fibre Raman laser technology, which was developed by ESO and transferred to industry, resulting in a Raman fibre amplifier laser that is lighter, more rugged, and represents a breakthrough in size and stability. I agree, illumination from the light saber could very well dominate. However the shadow line on the inside of the dome appears to sharply defined. It appears to be limited by the edge of the tube in a cone-like fashion. Scattered light from the beam should illuminate the structure below that line which must be the case because the camera is well below the lip of the tube and it sees the beam just fine. In any case, the details matter here. Where's vendetta when you need him. Aha! So, we're pushing the moon away, Mr. Heisenberg? up to: LE = REPlt/c where RE = the Earth's radius, Pl is the laser power & t is the duration time of the lasing. then the Moon must lose an equal amount of angular momentum (thereby bringing it closer). I don't know if they have to know what they're aiming at and if they have to get specific about it, or if they can just aim at a typical metal satellite whenever it passes and assume they'll get a usable reflection. Anyway, if they hit the LRO, they would alter its orbit around the Moon, rather than the Moon's orbit around us. But back to the Moon. I suppose if they hit it at all times of evening, it would average out to the same as hitting it when it is straight overhead (actually I should be saying "at zenith"). I'm actually thinking that there would be some tendency (for psychosocial reasons) to hit it more often when it is in the East, but maybe not. But what you're telling me is that I can bring the Moon down, if I shoot at it when it is going down. Why? The reflectors are made up of an array of corner cube prisms. They always reflect light back in the same direction of the incoming light. So it doesn't matter where the Moon is, other than atmospheric extinction possibly being an issue once it gets fairly close to the horizon. Yes, you "can bring the Moon down, if I shoot at it when it is going down" (for "psychopathic reasons?") thanks to photons hitting the Moon and being absorbed and/or randomly reflected. (Note: the laser beams at the Moon are hundreds of meters wide so hardly any of the beam gets intercepted by artificial objects.) Likewise, shooting lasers to the East slows the Earth's spin and sends the Moon into a higher orbit. 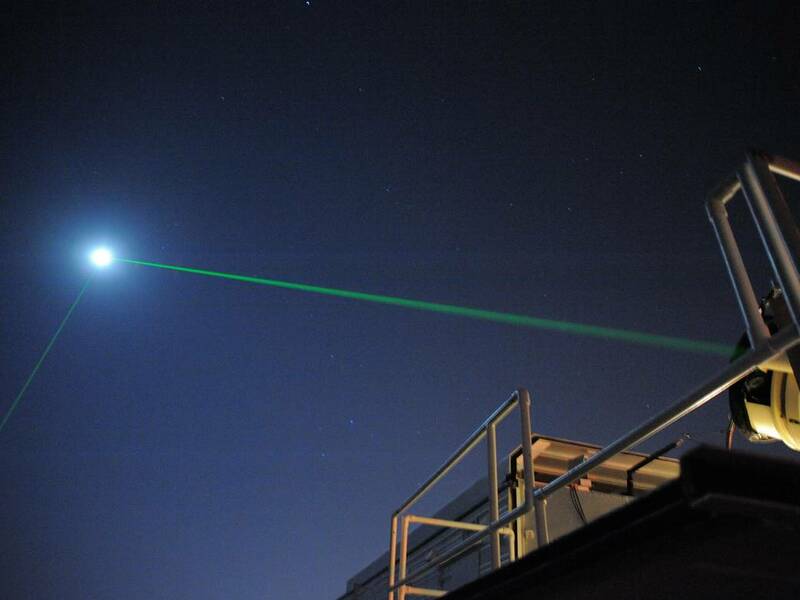 Shooting lasers with the Moon at zenith has no effect on angular momentum. However, if one only shoots when the Moon is approaching (i.e., from apogee to perigee) then one can slow the Moon until it has the least Energy for its fixed angular momentum (i.e., a circular orbit of radius Rc= 2/[1/apogee + 1/perigee] = 382800 km versus the current semi-major axis of 384400 km. If one only shoots when the Moon is receding (i.e., from perigee to apogee) then one can speed up the Moon until it has the most Energy for its fixed angular momentum (i.e., a parabolic orbit of Perigee = Rc/2 = 191400 km. The Apollo program's prisms are recessed into shallow cylinders, so sunlight illuminates them fully only at high noon. ... And then there is no apogee. Thanks for the analysis. That's what I call top-notch conic relief. Yeah. Like every one of those little molded plastic reflectors that you find on cars and trucks and driveway markers. Parity is conserved with an even number of reflections (but not with an odd number). Comparison of reflections of a pen in an ordinary mirror (left) and two perpendicular mirrors forming the first type of non-reversing mirror (right). The latter also illustrates the unsightly line in the middle if measures are not taken to minimise it. It was always fun to find buildings with 90 degree angle corners that one could hit tennis balls against and have them come back at the same angle.